Bovi put out a well-thought out event. The third edition of his annual one-man comedy show held in Lagos recently and it has remained the talk of town the whole week for more than the jokes but the spectacular moments too. Bovi and his team of comedians, musicians and friends managed to hold the audience in awe for three hours and it’s why we’re back here to refresh your memories on the five moments that stood out for us. 1. RMD! Richard. Mofe. Damijo. : How? Just how can one get past such charm, such grace, the appeal and everything else that makes RMD Nigeria’s favourite grandpa? 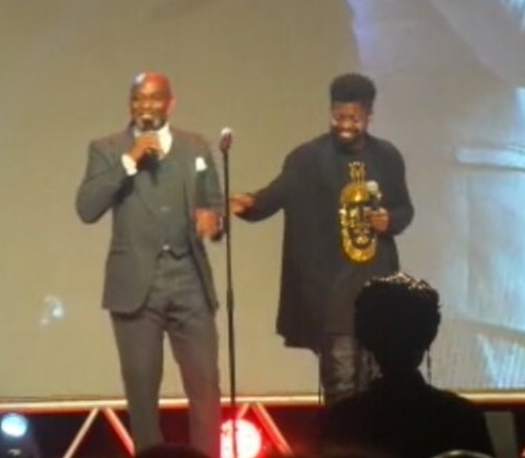 He walked on to the stage with that broad smile that drew all of us in and as he exchanged hilarious bants with Basketmouth, he dropped a line that sealed our love for him forever: “Grey hair is the new six packs“. Unforgettable! Then also, we can’t get past the fact that RMD gets the viral “amoshine” slang. 2. The Adesua-Banky W joke: This may have passed as distasteful for some but for us, it was a harmless and genuinely funny joke. Bovi harped on the error that was made on Banky’s proposal props to Adesua. Apparently, the word “Marry” was misspelt as “maary” and of course, it was a honest error. But Bovi said this error was a pointer to the fact that the marriage is already a mistake. LOL! 3. Falz walked in on us and gave us something to remember: Just when we all thought the show had ended, Falz jumped on stage and gave us the perfect ending. It was awkward how everyone picked themselves up and made for the exit door as soon as Bovi took a bow. We had no idea there was a final performance until a group of dancers appeared on stage in a perfect formation and a hypeman jumped all over the place in an attempt to grab attention. The hypeman failed, people didn’t stop walking until Falz’s voice boomed from the speakers, then PAUSE! We’ll leave you to imagine the rest. 4. The Big Brother Naija jokes: The reality show that took over Nigeria’s pop culture space for months still somehow found its way into this show. To be frank, BBNaija jokes will never be old (well for now). Instagram comic act, SLKomedy based all of his jokes on the housemates – from ThinTallTony to Bisola to TBoss and even the invisible Big Brother – and he had us in stitches his entire slot. 5. Even Senator Dino Melaye made it to the show: He was not physically present but the “ajekun iya” senator made it to the stage, thanks to Bovi’s acknowledgement of his act. According to Bovi, the senator is more famous for his musical rendition than his lawmaking. And that’s a fact we can deny!